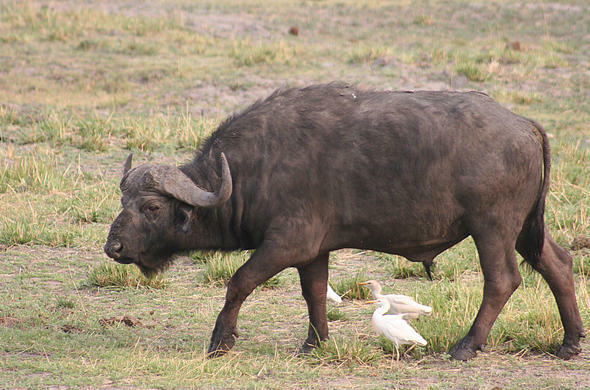 One of Africa's Big Five, Buffalo are extremely dangerous. 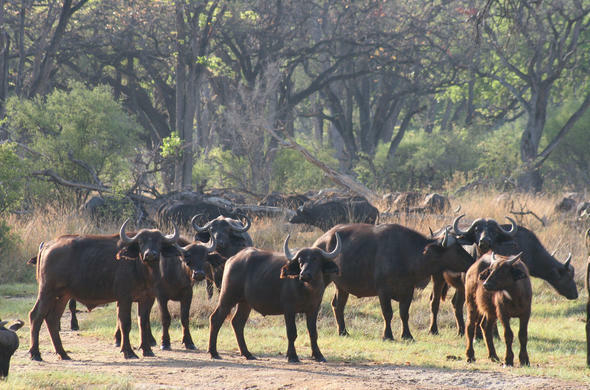 Nonetheless the Buffalo is always a much sought after sighting on your Chobe National Park safari experience. These huge animals are sometimes referred to as the "cattle of the bush" and are the favorite prey of lion. Buffaloes are heavily built mammals with hefty legs and large hoofs. The back hooves are characteristically smaller than the front hooves. Adult males are usually dark brown to black in colour and the females are relatively lighter in colour. Newborn buffaloes are generally a reddish brown colour. A Buffalo's horn is heavy with a central horn base or "boss," which is predominant and well developed in the males. The shape of the horn can be described as forming an embellished 'W' shape. Female horns are only found in adult female Buffaloes and are less pronounced. A Buffaloes ears hang below their horns and their tail ends in a tuft of long black or brown fur. 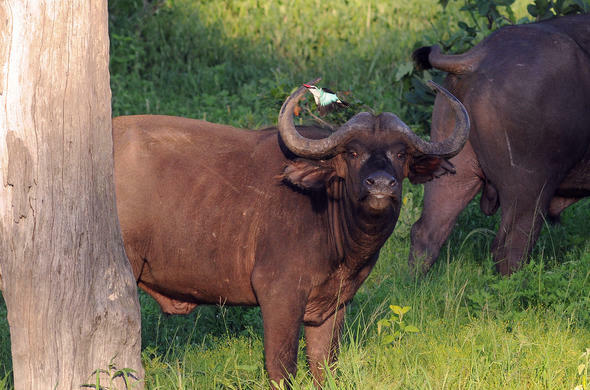 Buffalo are most commonly found in areas of woodland and savannah, they prefer to live in areas where there is a large amount of grass, water and shade. 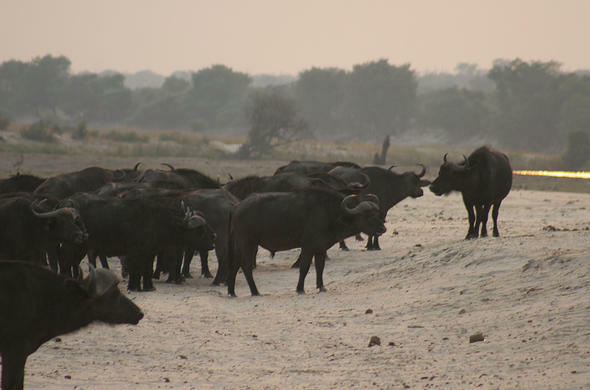 Buffalo are widely distributed in the Northern parts of Botswana, mainly throughout the Okavango and Chobe to the Northern Makgadikgadi. Buffalo are extremely sociable animals that travel in herds that can number in their thousands, although smaller herds can break away from the larger herd only to meet up again later. Bulls maintain a dominance hierarchy and the cows (female Buffalo) establish a pecking order amongst themselves. The dominant male mates with a cow that is ready to breed. 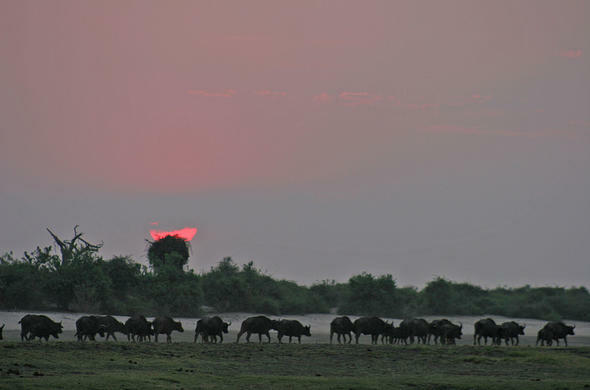 In the early morning, Buffalo will go down to the water and seek out shade. Buffalo are herbivores and eat mainly during the night by grazing and browsing for their food. A Buffalo pregnancy lasts up to 340 days, with most calves being born in the rainy season and summer months. A new born calf weighs 40kgs on average.